InteRDom Correspondent, Giselle, has completed the first year of her Bachelor’s degree in Political Science at Sciences Po, Reims, France. 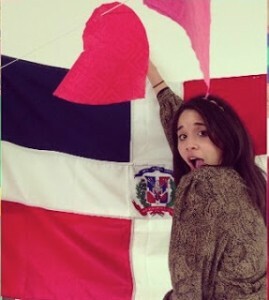 She is participating in the 2013 10-week Dominican International Student Program.You can read more about Giselle and her participation in the Correspondent Program here. Counting my days back to the island on an inexistent calendar has been excruciating. I’ve been torturing myself with this extreme consciousness of the day I set foot again on the soil that saw my birth, my growth and then later, my departure. Everyone says to oneself: “I won’t think about it” and that is the only thing you end up wondering about. The sun that’s so close you can almost touch it, the waves that hit the shore with a harmonic sound, the smile of the people everywhere as they go on with their lives, and the beat of the music that taught me how to move my hip from right to left are only a few of the millions things I’m longing for. I’m currently pale, a couple of pounds skinnier, bags under my eyes; I walk in a fast pace even though I’m worn out. Sleepless nights of studying, days that went and came in which I never saw the light, the cold that crept into my bones and made me shiver and my teeth chatter, house chores that were inarguably tiring; it is not only the locus that has changed but unimaginable accounts of my life, my personality, my tastes. This is not to say that the Dominican Republic is better than France, an assertion to which I can find innumerable arguments against. I’ve grown an adult, I’ve seen panoramas and experienced diverse cultures, I’ve tasted the nouvelle cuisine, I’ve learnt to speak different languages, isn’t that what I wanted as a young adult upon departure back home? I’m afraid to say the answer is yes; yes my ambitions and desires were all of the above and they have not been without completion. But there is that last piece of the puzzle that doesn’t fit, you put it backwards, inwards, spin it 180 degrees and it still doesn’t work. It’s like I’ve been constructed in a way in which I can only function to my maximum capacity while in my natural habitat, but needless to say how reluctant I’m of stopping to be a wanderer. As a wanderer I’ve learnt to see the beauty in every detail, to appreciate the air I breathe and the places I visit even though they’re not home. Believe it or not, I can find similarities all around me; objects, people and places that seem much like the ones I’d made myself used to. The woman at la boulangerie just in front wears the same apron as the woman in the colmado just around the corner. The crêpes I eat once I’m done with schoolwork taste more and more like the sancocho my mom treated me with after a hard day. The French strikers which stop transit and fight for better working conditions are a familiar picture of all the dominicanos complaining about the government on TV. When I walk across the Champs Elysées, the rocks underneath me resemble those that pave La Zona Colonial. Even la Tour Eiffel under turquoise skies looks at me and invites me for a pilgrimage towards la Iglesia de la Altagracia. I had not realized how much time I had spent writing this. Now that I look at the clock hanging off the wall, it is yelling: TIME TO GO HOME.